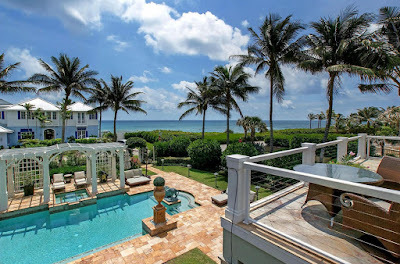 Florida Real Estate: Ocean Ridge Estate On The Market! This spectacular ocean oasis is the luxury estate you’ve been dreaming of in Ocean Ridge. Designed by renowned architect Randall Stofft, this British West Indies mansion has continuous waterfront vistas. Featuring over thirteen thousand square feet of precisely created living spaces the property boasts six bedrooms, eight full baths, one half bath, private guest house and 4 car garage. Impressive custom mill work is displayed throughout the home, notably in the grand hall, living room and seas side loggias. At the heart of the home is an chef's's dream kitchen. Featuring a full size Sub-Zero fridge and separate freezer, Wolff gas cook top, double ovens, steam oven, Wok cooking station, and built in Miele coffee machine. A large butler's pantry complete with warming drawers, dishwasher and wine cooler, leads to the formal dining room which is graced by antique leaded glass doors from France. The Master Bedroom is a hidden sanctuary with immense closets and dual baths, each equipped with the most splendid and rare fittings. The poolside pub and billiard room is the ideal place to unravel after a day at the beach, or sit back and relax in the newly refurbished media room with plush reclining seats for eight and 3-D theater. The state of the art home gym includes a Kinesis Techno Gym for the utmost in personal training. A stunning 2,000 bottle temperature controlled brick wine cellar helps to make this a perfect home for entertaining on a large scale. All the major rooms have endless ocean vistas, balconies and verandas to catch the southeast breezes provided by permanently unobstructed beachfront. A complete outdoor kitchen poolside is perfect for parties large and small. Covered terraces, romantic pergola and elegant tropical landscaping complete the resort style exterior. Other state of the art features in this impeccably maintained residence include: elevator, full house stand-by generator, HD surveillance Cameras and full security system, smart house technology, and commercial grade water conditioner/filtration system.